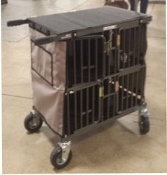 Dog Show Trolleys are an indispensable part of dog show equipment to exhibitors worldwide. 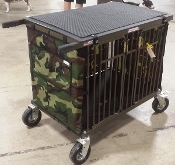 Show Trolleys not only protect the hours of work preparing coated breeds for the show ring, but offer security from parking lot to ringside, a feature not missed by short haired dogs also. A mobile, lightweight combination grooming table and security cage with the added advantage of folding up to a space saving 6 inches width. Best In Show Trolleys are the original manufacturers of collapsible tubular aluminum Show Trolleys from Australia and have supplied exhibitors worldwide for over 40 years. All trolleys are constructed from corrosion resistant lightweight tubular aluminum and features powder coated baked on enamel in striking colors. Choose from beautiful shiny; Candy, Hammered, or Sparkle finishes in a variety of colors. 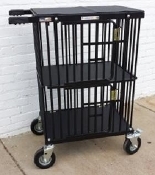 The Best In Show Trolleys feature safety spring loaded return gate catches with one hand operation and 6 inch flat free foam filled wheels, 2 of which are swivel total lock wheels. The lids and floors are made from a strong durable recycled ABS thermoplastic material which will not absorb orders and is water proof. The trolley design includes Food/Water coop cup bars and Fan bars. Standard features also include rubber handle grips and a grooming mat. 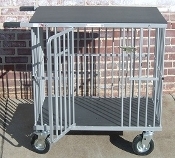 As each Trolley is custom made, please allow 6-8 Weeks for delivery.